One of the most energetic colors in the rainbow is lime green. What I love about this color is how lively it is while also having a soothing, relaxing vibe, as well. It reminds me of a tropical forest where you at once feel refreshed and reinvigorated while also feeling at peace with nature all around you. Lime green works well in any space in the home. A little bit goes a long way in a few accents but if you want to take it a step further, a bold, vibrant touch of lime green on an accent wall or sofa will make a stunning impact in your decor. There are a ton of beautiful ways to use this fresh color. 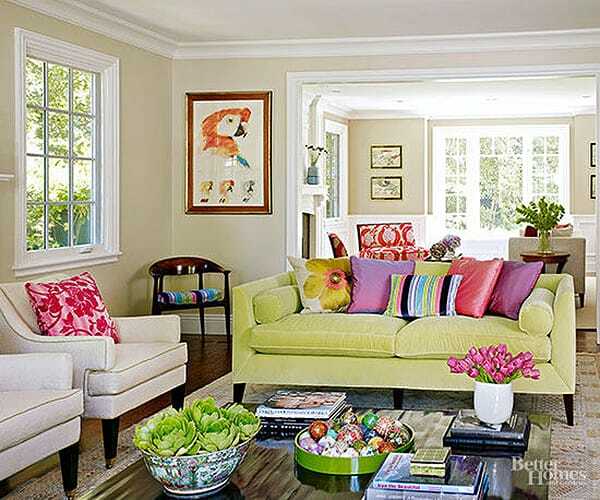 Here are 10 examples of rooms with lime green decor to give you some ideas and inspiration. A beautiful lime green and blue toile wallpaper accent behind the bed matches the comforter and brings an elegant but lovely touch to the bedroom. 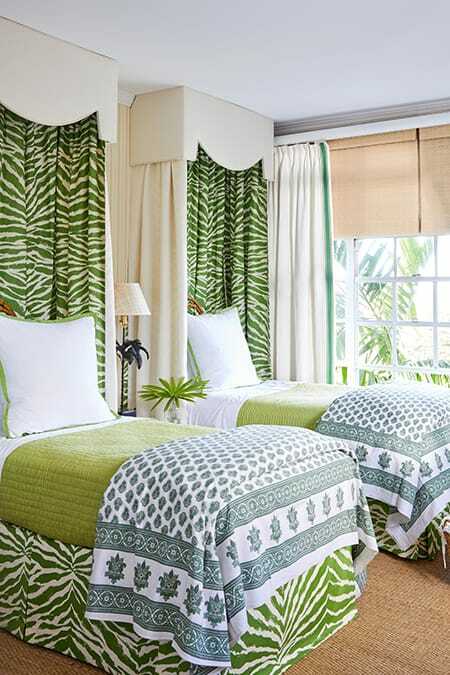 This bedroom looks like a stylish tropical escape. You can imagine waking up on an island! 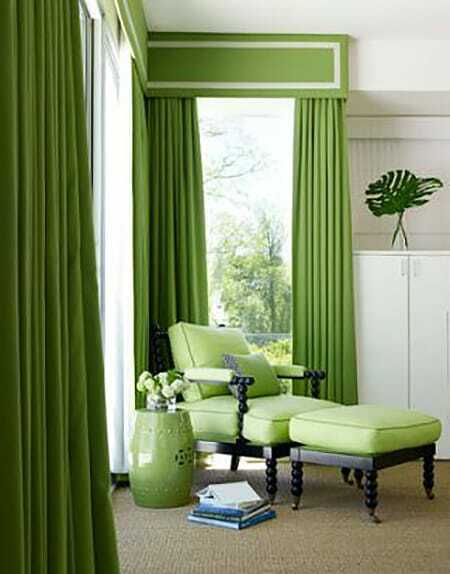 The lime green floor-to-ceiling curtains are a stunning touch that infuses the space with energy. 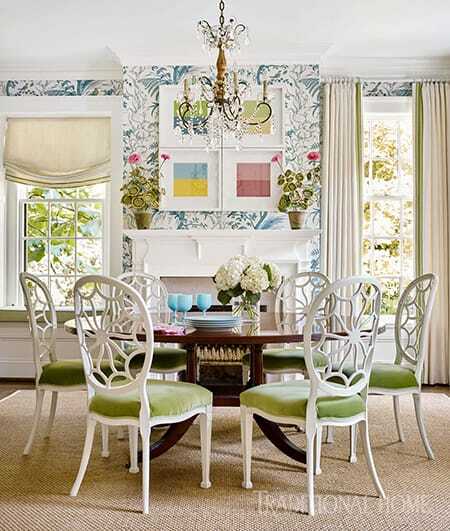 A touch of lime green on the chairs brings some personality to this elegant dining room. 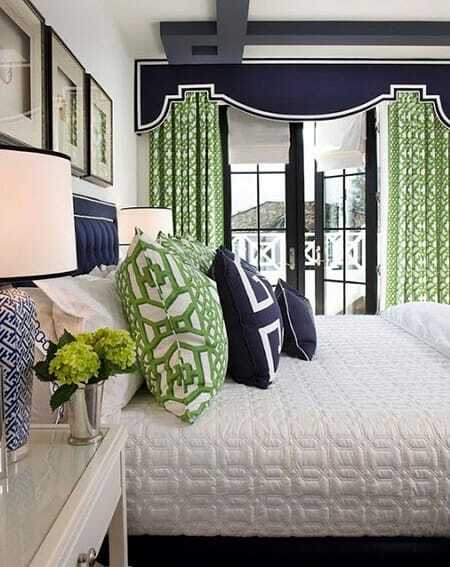 There is something about the pairing of lime green and navy blue that is fresh and classic. This corner reminds me of a fresh green apple – so classic and beautiful! How could you not feel energized to take on the day after waking up in this refreshing space? 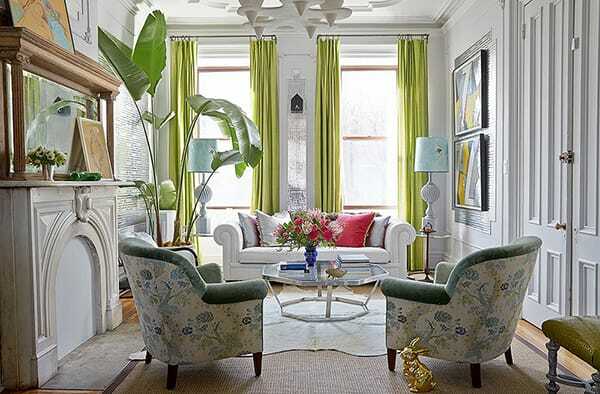 A few lime green accents infuse some energy into this relaxing living room. Love all the beautiful colors at work in this space, especially the lime green sofa and accents. 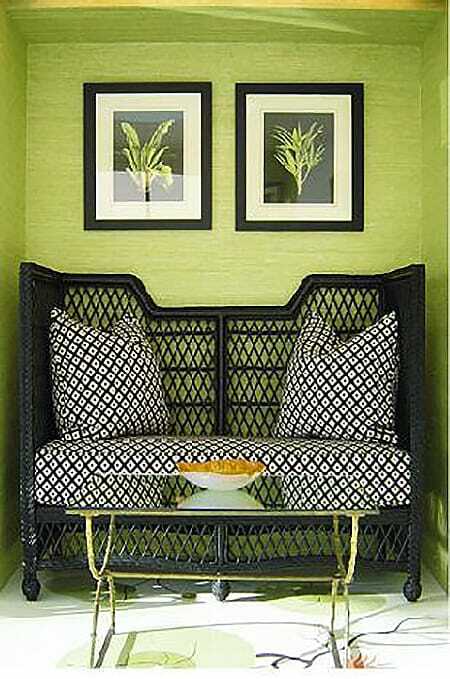 Lime green and black look chic and sophisticated (like an upscale tropical hotel) when paired together. Lime green is such a beautiful color to work with!